While most retailers look for uniformity in their branding—a common experience, an expectation of similarity and sameness—Barnes & Noble College strives to do something very different. Ask any bookstore manager and they’ll tell you, ‘It’s not our store; it’s the college’s store.’ And while there’s a high expectation of quality and service in all of its stores, the company also looks for individuality and a reflection of the mission and culture of each one of its campus locations. Ensuring that kind of flexibility, while also managing businesses as diverse as academic bookstore retailing, café and convenience, and general merchandise operations—places strong emphasis on the company’s operational expertise, much of which occurs seamlessly and without the customer even noticing. What’s currently benefiting many customers this fall is the company’s Price Match program, which began last year with a pilot of approximately 80 stores, and has grown to now include over 470 stores. “Rolling that out requires a lot of coordination to communicate the value of the program, so it’s important to ensure each store has marketing pieces, signage and training materials to build awareness,” Bronicki points out. Registers are preset with a Price Match button, which helps track program reporting. Additional components are posted on each bookstore’s website to acquaint online and mobile shoppers with the program’s advantages. Content is also posted on each store’s social media sites, such as Facebook and Twitter. “There’s also a significant training component to Price Match, so we help our booksellers easily validate pricing and make sure a particular title is being price matched and rung up correctly—either in-store or online,” explains Bronicki. 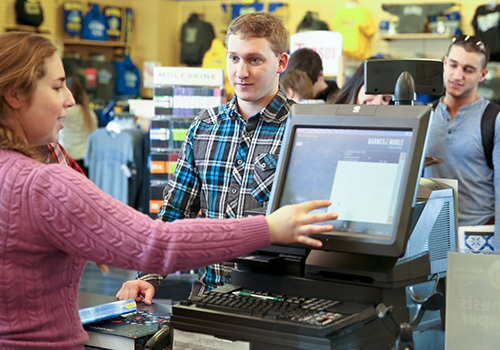 This fall, shopping at the bookstore will also provide more payment options, with the store websites now accepting MasterPass, along with Visa Checkout, which was introduced last year, as another form of tender. There will also be a greater focus on mobile, as students will be able to shop from the aisles with their mobile devices—and feel more secure—with EMV Chip encryption technology, rolling out to all stores after Rush. 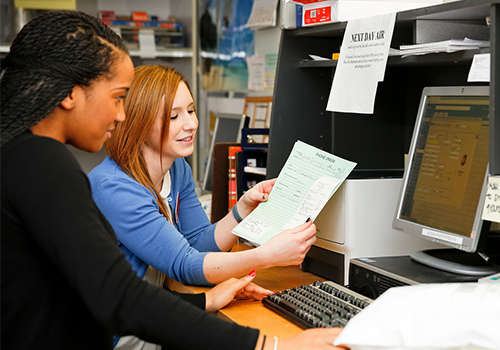 While relying on customer feedback from students through the company’s extensive research capabilities, the Barnes & Noble College operations team have also created the Store Process team, a revolving group of experienced Barnes & Noble College store managers who provide ongoing insight and recommendations. They are also tasked with evaluating new ideas and creating enhanced store opportunities. “We have so many initiatives going on, and we tend to roll out things quickly, so we wanted to make sure we had a forum to be able to get good feedback from the field, and help us develop an open dialogue,” explains Karen Sweeney, Vice President of Operations for Barnes & Noble College. “They’re the ones out there, working in the aisles with students and engaging with our clients, so they’re able to funnel that feedback back to us to ensure we’re focusing on the right things—and that we’re really in tune as we map out our initiatives and our long-term strategy,” she adds.